Solly March celebrates his equaliser in Brighton's quarter-final tie with Millwall. Picture courtesy of Getty Images. Brighton & Hove Albion produced the greatest comeback since Lazarus to book their place in the FA Cup semi-finals for the first time in 36 years. The Seagulls trailed 2-0 to division-below Millwall, after second-half strikes from Alex Pearce and Aiden O'Brien, but an 88th minute strike from Jurgen Locadia and 95th minute equaliser for the excellent Solly March forced extra-time. Jurgen Locadia celebrates reducing the deficit in Brighton & Hove Albion's FA Cup quarter-final at Millwall. Further pictures by PW Sporting Photography. Neither side could find a winner in the extra period so the game went to penalties and Brighton came out 5-4 winners after Jake Cooper smashed his spot-kick over the bar. Albion boss Chris Hughton made one change from the side that overcame rivals Crystal Palace last Saturday, with Beram Kayal replacing the suspended Yves Bissouma. Neil Harris made two changes to his Lions team that picked up a 2-0 away win at Birmingham City in the Championship on Wednesday. The cup-tied pair Ben Marshall and Ben Thompson made way for Irish internationals Shaun Williams and O'Brien. Millwall had the better of the games opening quarter of an hour. Jed Wallace flashed a shot that went just wide of Mat Ryan's post on three minutes before Lee Gregory's speculative volley went off-target. Dale Stephens looks to close down Lee Gregory. Five minutes later and a swung Wallace free-kick found the head of Jake Cooper but his attempt was straight at Ryan. Shane Duffy put his body on the line on 14 minutes to charge down two long range efforts from Wallace and Williams. Brighton had their first clear-cut opportunity on 26 minutes. Anthony Knockaert did well down the right flank to find Davy Propper. The Dutchman flew down the flank to cross and his ball into the area found Kayal but the Israeli slipped and his attempt was easily take by Millwall 'keeper David Martin. Beram Kayal had several chances for the Seagulls. Two minutes later Gregory received the ball from Cooper in the box and the Lions frontman produced an acrobatic hooked shot that landed on the roof of the net. The visitor had an even better chance to break the deadlock on 36 minutes. Knockaert swung a delicious ball into the host's penalty area and Kayal, escaping his marker, couldn't quite get enough contact on his free header to trouble Martin. Brighton had the final chance of the half as Duffy headed wide from Knockaert's whipped cross. However there were suspicions that the Irishman was severely impeded by Cooper in the box. With no VAR on offer at Championships grounds during the FA Cup, the incident could not be reviewed and replays suggested that Albion were unlucky not to be awarded a penalty. Bernardo attempts to block a Millwall cross. The Seagulls were nearly left red-faced three minutes after the restart due to a defensive mix-up. Duffy shielded the ball from the onrushing Gregory for Ryan to clear. However, the Australian's clearance rebounded off the Seagulls defender towards goal but Ryan did well to recover to prevent Gregory from pouncing on his mistake. The skies then darkened and the heavens opened as hail fell from the sky. The atmosphere, which had been simmering away nicely, exploded into life as a wall of sound from both sets of supporters crashed against all four corners of The Den. The two sides then exchanged goalscoring opportunities on 58 minutes. A 20-yard drive from Kayal was parried out by Martin before Gregory slid in Wallace who was denied by a superb sprawling save by Ryan. A lovely passing move from the hosts on 64 minutes saw Williams shoot from just outside the area straight at Ryan, and a minute later the Australian was quick off his line to deny Gregory. The Lions had been slowly turning the screw on Brighton, and all there pressure paid off as they took the lead on 70 minutes. Pearce was left completely unmarked at the back-post from a Williams corner to bury the ball home in a crowded box to give Millwall a thoroughly deserved lead. Hughton threw on Locadia and Jose Izquierdo for Kayal and Knockaert in search of an equaliser but Brighton still looked lethargic and devoid of ideas. With eleven minutes left Wallace broke through and played a low ball across the face of the box for O'Brien, on his 200th appearance for the club, to tuck home and double Millwall's advantage. Albion almost responded straight away as Murray headed wide from a Bernardo cross but they did eventually reduce the deficit with two minutes to go. Locadia smashed home, after March's attempt was half-cleared, to give Brighton a glimmer of hope of extending their stay in the FA Cup. Deep into added-time and Izquierdo should have levelled the game. Great work from March found the Colombian out on the wing but his lame effort was gratefully taken by Martin. However, in the fourth minute of stoppage time March somehow found an equaliser for the Seagulls. The Albion academy product was fouled down the right and his free-kick into the box was completely missed by Martin and the ball nestled sweetly into the top corner. From 2-0 down, Brighton were back from the dead and they now had 30 minutes of extra-time to seal their place at Wembley. The Seagulls had their first chance five minutes into extra-time as Izquierdo's shot was saved after the Colombian had cut inside from the left. Ryan was then forced into a quality one-handed save to deny sub James Meredith a minute later. The ball then fell to Mahlon Romeo on the follow-up but he blazed his chance wildly over the bar. Brighton had the final chance of the first-half in extra-time. A Seagulls counter-attack found March but his near-post shot was parried away for a corner, which came to nothing. Four minutes into the second-half and Izquierdo sent a low ball into the area but the onrushing Locadia slipped, preventing the Dutchman from putting home an easy finish. With three minutes of the extra period to go, Locadia fired over after Milwall could only half-clear from a corner. Dale Stephens' attempt from outside the box went straight down the throat of Martin as penalties loomed. In a breathelss finale, the Lions' Northern Irish full-back Shane Ferguson was sent-off after stamping on Seagulls' captain Lewis Dunk before Albion had the ball in the net. Locadia's well taken finish from Martin Montoya's cross was rightly adjudged to be offside as the full-time blew and the lottery of a penalty shoot-out beckoned. Penalties were to be taken in front of the Brighton following and Glenn Murray, largely anonymous throughout the game, stepped up. His penalty crashed off the post, and the advantage was Millwall's. Williams put the Lions in front, before Locadia stepped up to level from the spot. Ryan Tunnicliffe confidently dispacted his spot-kick past Ryan before the superb March rifled his penalty into the roof of the net. Ryan Leonard then bludgeoned his kick past Ryan, followed by a cool and composed penalty from Propper. Ryan then produced a superb with his legs to save Romeo's penalty. Stephens then tucked the ball into the left hand corner to level it up at three successful penalties each. With the game now at sudden-death veteran Steve Morison for Millwall converted his spot-kick and Dunk followed suite for the Seagulls. 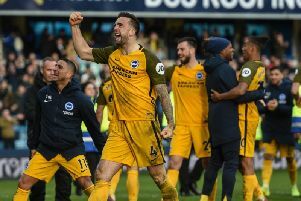 Cooper stepped up for the hosts knowing he had to score to keep Lions in the game but he lashed his penalty over the bar and Brighton were on their way to Wembley after an epic 120 minutes. Millwall: Martin, Romeo, Pearce, Cooper, Ferguson, Leonard, Wallace (Hutchinson 90+3), Tunnicliffe, O'Brien (Meredith 85), Williams, Gregory (Morison 90). Unused: Amos, McLaughlin, Elliott, Skalak. Brighton & Hove Albion: Ryan, Montoya, Duffy, Dunk, Bernardo, Kayal (Locadia 73), Stephens, Propper, Jahanbakhsh (March 67), Murray, Knockaert (Izquierdo 73). Unused: Button, Bong, Bruno, Burn.